Mommy Maestra: Free Download: Spanish Words Ending in "ción"
I'm so excited to welcome back MommyMaestra sponsor, Spanish for You! for another year! This month's freebie from Spanish for You! 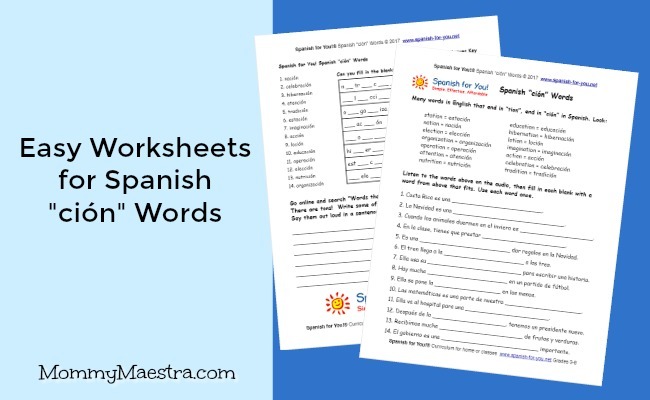 is a set of worksheets that you can use to help your child with those pesky Spanish words that end in "ción." This printable 2-page activity comes with an audio file for learning proper pronunciation. Your little Spanish learners will learn key words such as "educación," "celebración," and "acción." Nice suggestions - Incidentally , people need to fill out a MD VR-129 , my family encountered a blank version here http://pdf.ac/4x8Nmc.